For me, I don’t know about you, one of the pleasures of travelling is eating authentic food it the location of its origin. I’m sure that you’ve found too that a Pizza Napoletana in Naples is nothing like the one from your local pizza place. Just one daft example. It’s true though that for me, the food is a huge part of my travel experiences. When I think back to my very favourite moments in life, they have always occurred when I’ve been on a trip away from home and they invariably have a dining component somewhere along the line. An excellent game to play when you’re travelling is to enjoy eating the foods that were named after your location – vichyssoise in Vichy, gouda in South Holland, Jersey potatoes in the Channel Islands, Kendal mint cake in the Lake District, quiche lorraine in, well, Lorraine. It’s particularly easy – and delicious – in countries like France and Italy where almost every village has its own gorgeous cheese. 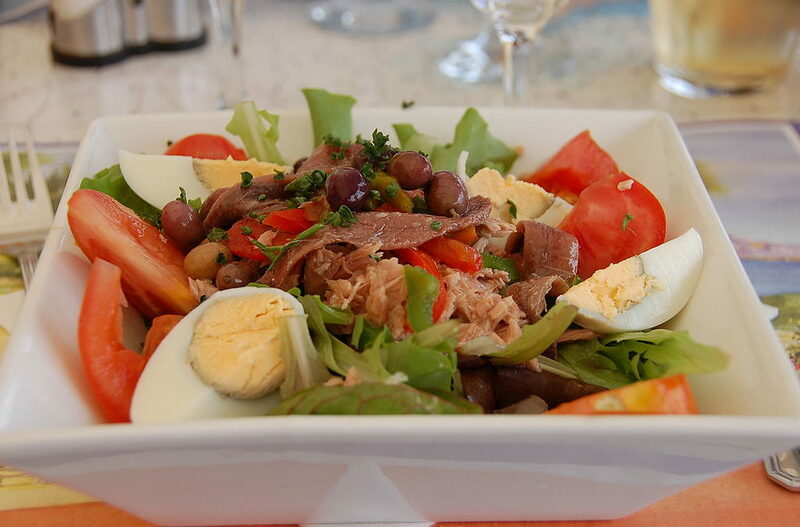 Nice, in southern France, has plenty of specialities of course, but probably the best-known is the Salade Niçoise. (Pissaladière is another local favourite not to be missed). There are, of course, foodie purists. These people insist on eating the traditional version of this salad – tomatoes, anchovies, olives, oil, hard-boiled eggs and maybe a smidgeon of greenery. Then others believe that all dishes are in a constant state of evolution and that variations are acceptable. This simple dish has frequently caused discord. As recently as 2016 there was a Facebook furore what a chef posted a recipe for the salad that included cooked potatoes and green beans. There was an uproar. Throughout the world, restaurants have added Salade Niçoise to their menus and many times, it means nothing more than ‘mixed salad’; often made up of whatever is to hand. Like me, you might have eaten various versions of this salad but, unless you’ve enjoyed the dish in Nice, have never truly experienced it.